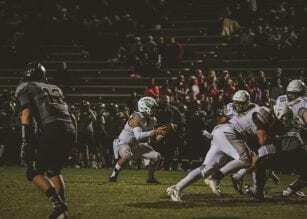 DAWSONVILLE, Ga. – Highly-motivated Lumpkin County is next up for Coach Sid Maxwell’s Dawson County Tigers and the Indians would like nothing better than to swing into Tiger Stadium Friday and upset the state’s No. 10-ranked Class AAA team. Lumpkin County (4-4, 2-2) is still hoping to earn the second seed in the Region 7-AAA playoffs. They could achieve that with a win Friday should the Tigers lose to No. 1-ranked Greater Atlanta Christian next week. But that is a very big mountain to climb. Coach Sid Maxwell’s Tigers (7-1, 4-0) are unbeaten at home this year and currently riding a five-game win streak. Since an early-season double overtime loss to West Hall, no one has come within 14 points of beating Dawson County. Coach Shane Williamson’s Indians feature a ground-and-pound offense led by a trio of good runners who average better than 6 yards per carry. Senior fullback Zach Matthews is the leading rusher with 1,152 yards and an average of 6.1 yards per carry. Running back Cole White is next, having rushed for 627 yards and an average of 7.5 yards per carry, followed by quarterback Chandler Woodham with 580 yards rushing and an average of 6.1 yards per carry. But Lumpkin County appears to pass out of necessity. Woodham has a completion average of just 34.9 and has only passed for an average of 28.4 yards per game. Dawson County should be a highly motivated bunch also. A victory sends the Tigers into a much- anticipated showdown with GAC next week for the Region 7-AAA championship in Tiger Stadium. And these Tigers have a lot of weapons on offense, defense and special teams. Quarterback Coey Watson has amassed 1,756 yards in total offense and accounted for 24 touchdowns. Payton Myers has rushed for 452 yards and scored seven touchdowns. The wide receivers are dangerous Austin Young, who averages 18.9 yards on 36 receptions and has scored seven touchdowns. Speedy Nick Murphy averages 16.2 yards per catch and has scored four touchdowns. The Tigers defense is one of the region’s best. At East Hall last week, they turned in three goal line stands, holding the Vikings scoreless on three trips inside the 10-yard line. Linebacker Luke Martin is the ring leader. He has 121 total tackles for an average of 17.3 per game including 16 tackles for a loss. Defensive back Colin Glover averages 12.7 tackles per game and Jeremy Whalen averages 10. Dawson County’s opponents are learning to kick the ball away from Kolton Brumbelow who has scored on kickoff returns of 95 and 99 yards. Defeating Dawson County in Tiger Stadium may be too formidable a task for the Indians.